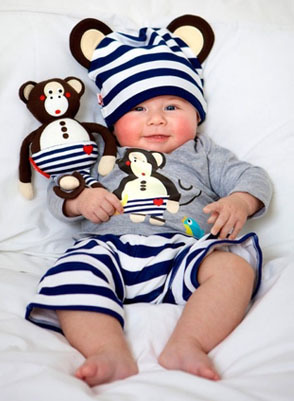 The biggest thing to consider when buying infant clothing is the quality of the clothes. Of course you want your baby to be stylish and cute, but there is no reason to sacrifice your baby’s comfort for fashion. The material of your baby clothes should not irritate the skin. Buying organically made infant clothing means the material has no harmful chemicals, which protects your baby’s soft, vulnerable skin. Cotton or wool is highly recommended because it keeps your baby cool in the summer months and warm in the winter months. Newborn clothes and infant clothing should never be too tight-fitting or loose-fitting. It may seem confusing as to how to buy just the right size, but having multiple sizes of baby clothes means that you’ll be able to properly dress your baby with the right-fitted clothes. Remember that babies grow out of their newborn clothes fast, so having multiples of the same outfit that fit well isn’t a bad idea. He will grow into the next size soon enough. White onesies are very popular. Not only do they keep your baby’s skin cool, they are easy to clean. When choosing what types of infant clothes to buy online, make sure that the clothing you buy can withstand your method of washing. Hand washing and dry cleaning your infant clothes are possible options; however, most people prefer to machine wash their baby clothes. Newborn clothes tend to get washed more frequently, so make sure your newborn clothes can handle the wear and tear. Another tip when buying baby clothes online is to avoid zippers, elastic that is not properly covered, or other openings that can cause discomfort and soreness on your baby’s skin. Stay away from large bows, knots, or other raised decorative pieces on the front of your baby clothes. This can create mild to severe annoyance and discomfort when your baby attempts to lie down on his stomach for a nap. Also, things that are sewn onto your infant clothing may not feel so good underneath the shirt or pants. When in doubt, contact the seller; however, it still may be in your baby’s best interest to stay away from buying these items online. Choose snaps in the crotch and down the leg to make changing your baby’s diapers a little easier. Babies tend to dislike things going over their heads and faces so make sure that the neck of your baby’s shirts and sweaters can be opened wide enough to pass over their heads with little struggle. One last thing to plan for when buying your newborn clothes and baby clothes online is cost and return policies. Things are not always as they seem and online retailers can be vague when it comes to other fees and charges. Be alert of the final sale; if the cost is more than you expected, check to see that no charges were added to your purchase without your knowledge of the fine print. Most online retailers consider your purchase to be final sale. If you think you might need to return your infant clothes, make sure you know what type of return policy is available.